4-H was my first leap in cooking. I learned how to make dishes from the project recipe books with lots of practicing. But, I have never taken a cooking class. I’ve seen plenty of food demonstrations (that will be a future blog post) but never taken an actual class from a chef. Ever since the macaron adventure in February 2012 I’ve been obsessed with macarons. 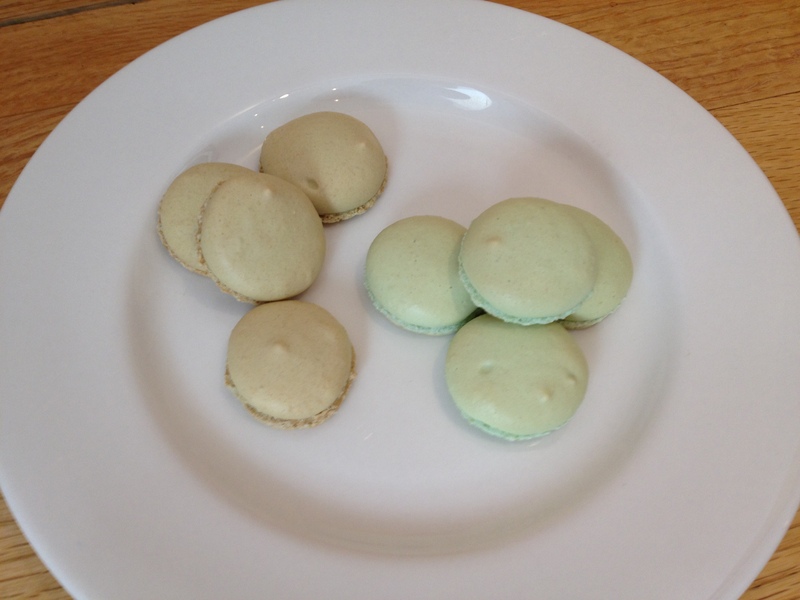 I have looked at different recipes on blog posts and macaron cookbooks. jothetartqueen has a chocolate macaron recipe; The Seaside Baker, my BlogHer Food friend, makes tons of macarons and has several flavors posted on her blog; and a friend went to France and brought back a package of French macarons and a macaron cookbook completely written in French. I saw an opportunity to take a macaron cooking class. I thought I could learn from a professional chef and fine tune my technique. After all, I am self-taught, studying recipes and cooking by lots of trial and error. I wanted to see what an expert could teach me. I was off to a rocky start as I rolled in 15 minutes late and as my online reservation wasn’t received. But, they had room in the class and I fell into an affable group of two women, Erin and Susan, who welcomed me to the class. Susan has a knitting blog, so we bonded quickly. When I jumped in, Erin was sifting the almond flour with the powdered sugar. 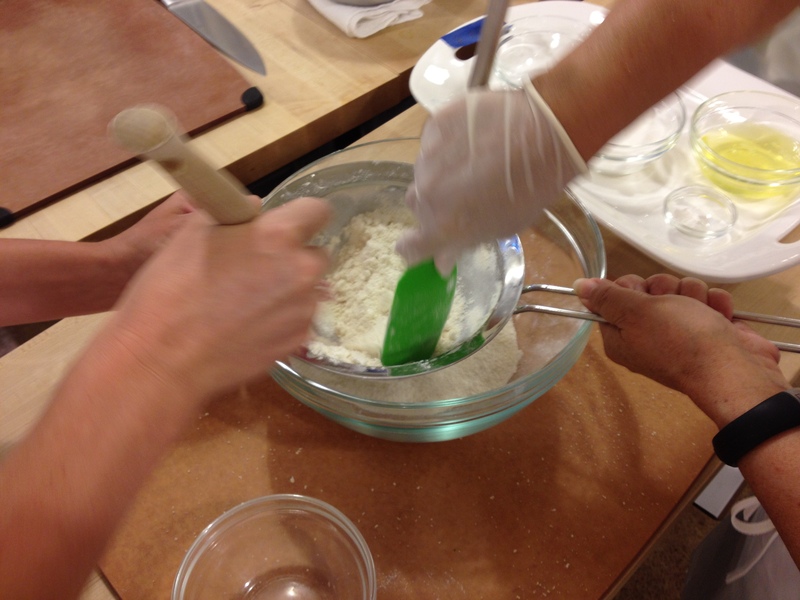 Tip #1 was to sift the dry ingredients twice for a finer flour and to throw out the bigger pieces. You could even put it in the food processor first before sifting. You can’t over sift the dry ingredients. Tip #2 store your almond flour in the freezer so it doesn’t spoil. Next was the egg whites. Tip #3 whip them until foamy on a medium speed before adding the sugar and when the sugar is incorporated whip at a high-speed until stiff peaks are achieved. Deborah our chef said the bowl did not have to be cold but the egg whites should be at room temperature and “aged” at least one day. 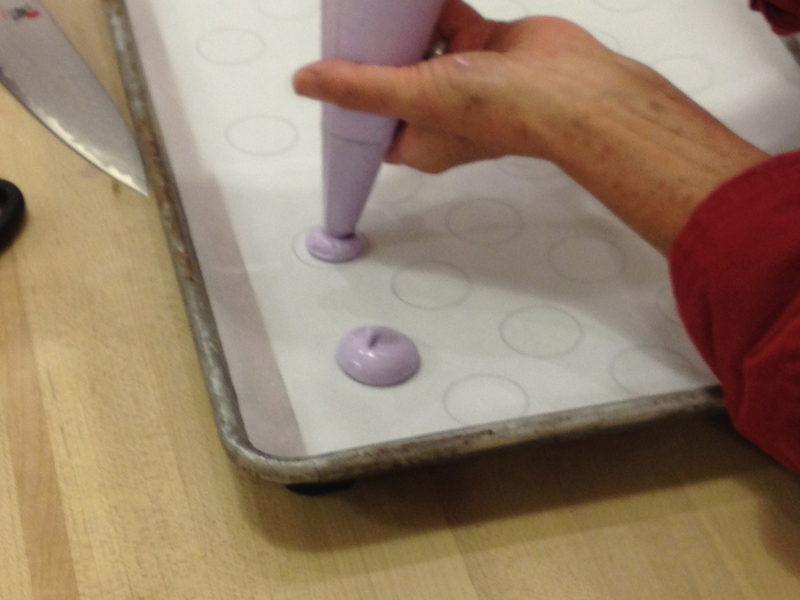 Tip #4 use a Silpat liner under the parchment paper to prevent burning as well as an extra cookie sheet underneath. Our first batch of blueberry macarons turned out great. Perfect in fact. Then we learned how to make a berry cream filling. That was new for me because I have used pre-made fillings like curd, jams, Nutella, or caramel in the past. I volunteered with three other students to go to the stove and make the filling. It turned out to be a lovely curd-like filling using cream, marscapone cheese, berry filling, eggs and sugar. So I took those techniques from class and fine tuned my macarons. Problem #1: Too hot an oven. The recipe called for 375 degree oven. After the first batch I turned it down to 350-360 degree F. See the first batch on the left is a little too brown compared to the light green batch on the right. 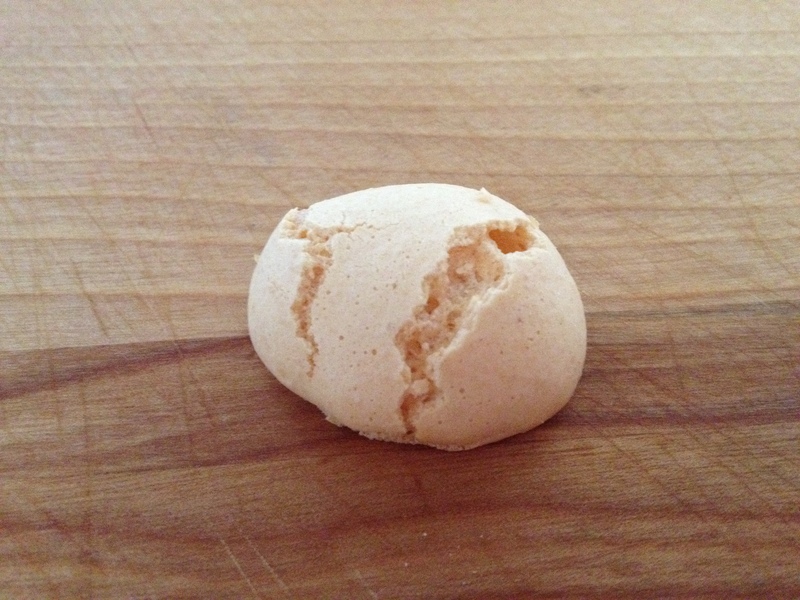 Problem #2: Cracked macaron. I think this happened because I didn’t let this batch dry completely for 30 minutes, I might have popped them in at 25 minutes. Problem #3: Powdered mango. The mango macaron recipe called for powdered mango. In our class we had powdered mango. I asked Chef Deborah how to make it and she said to food process dried mango. As you can see below that did not happen. I dried it in the oven twice and pulverized it 2-3 times in the food processor and I got maybe 2 pinches of mango powder into the mix. I added some water to it and used it to make my filling. 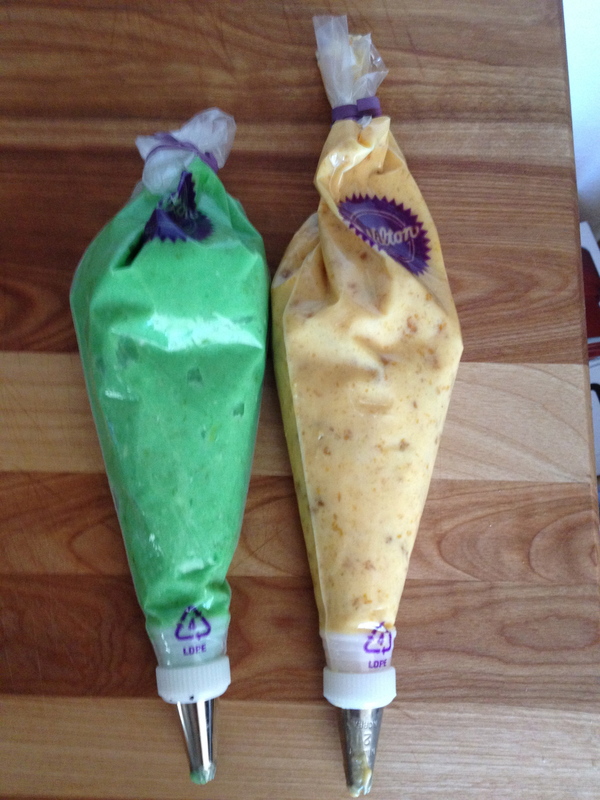 I made two fillings Lime Cream and Mango Cream. I can’t believe I used a stick of butter for each of these fillings with the curd flavoring. They tasted good. mmmm butter. 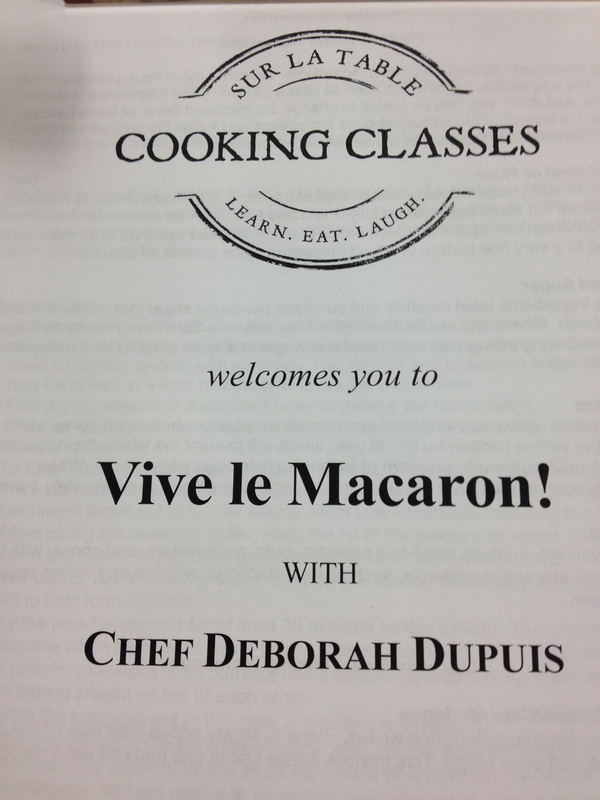 While I was in the class, I asked lots of questions and I think Chef Deborah liked that. There were four groups of students, 15 in all, and four helpers clearing away our dishes. If I was taking the class for the first time I would’ve been overwhelmed. Making macarons calls for many details. I knew my subject and kept up with a fast paced class. All in all, I am glad I took the class. I felt more confident making my macarons today. 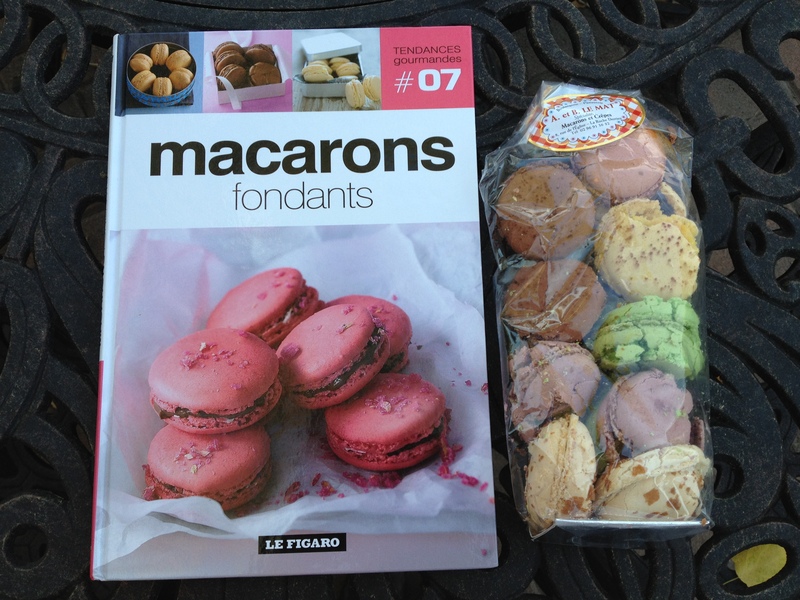 This entry was posted in Baking, cooking, Culture, Eggs, Food, food blogging, France, Macaron and tagged baking, cooking, food, food blogging, France, French cooking, Macaron. Bookmark the permalink. Patti-The Macarons look amazing! Bet they tasted as good as they look. Thanks for dropping by my blog. I’d love to have you over for tea. They look beautiful! 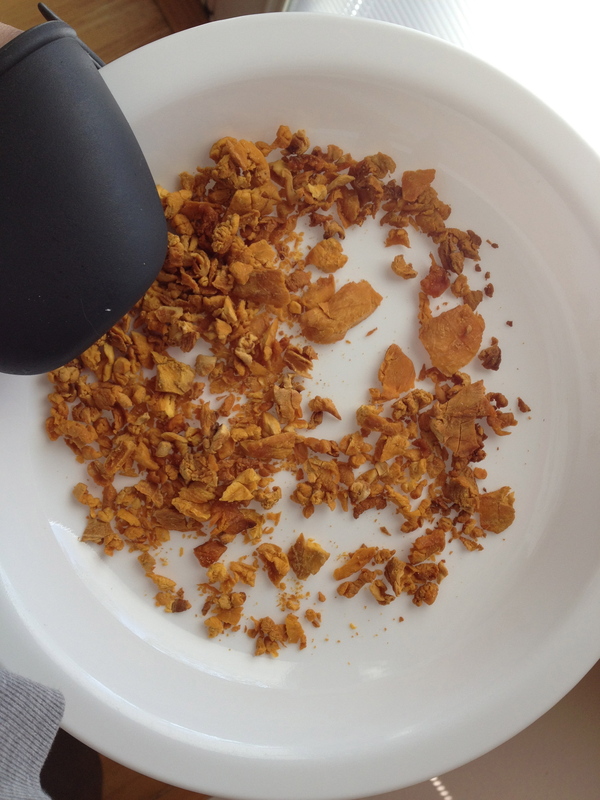 I love the tip on pulverizing dried fruits for flavor! You were an inspiration as well. Those macaroons look awesome. I wish I could try one! I’m impressed that you were late for class and still could keep up with everything. That’s me always late. But I have good intentions of being on time. Hi Patty.. I can see that you are now obsessed with macarons!! p.s I like that kitchen towel of yours..such a cute phrase! The berry filling in class was cream, egg, non-flavored gelatin, marscapone cheese. My home mango and lime fillings were a curd with the gelatin and butter whipped in at the end. 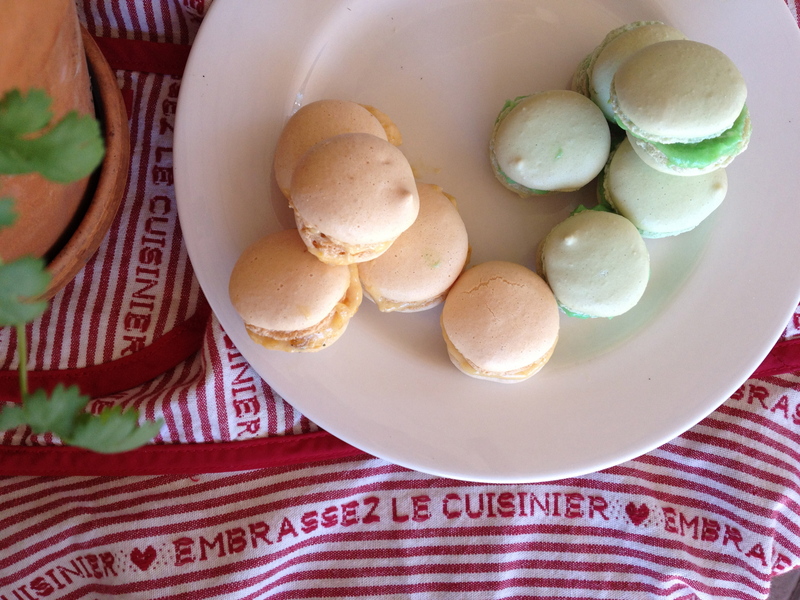 The lime was actually suggested to go with the mango macaron with peachy food coloring. I need to find powdered macaron now. My new quest. The towel is actually an apron I got several years ago for my birthday. It is cute isn’t it? the mango and lime fillings sound really good too..is it necessary to use gelatine? Wouldn’t it be of piping consistency with the curd and butter alone? love that apron! what a great gift! Sorry I meant powdered mango which the cooking class had for adding to the dry ingredients for the mango macarons. I think I will look on the internet for powdered mango because it was an amazing addition to the recipe. I was a little taken aback by the gelatin addition to the filling too. It didn’t work out too well for me so I skipped it. It would need to melt into the cooked curd really well. I have tried making these before, and the hardest part for me was delicately taking them off after being in the oven. yes I think I have experienced just about every problem with macarons. Even though I have queried bakers about the combination of almond powder/powdered sugar to egg whites they didn’t think it was a factor. But I have tried about three different recipes and I think it makes a huge difference. It is all about techniques. I am the biggest klutz and extremely hard-headed so I was determined to master it. Now that I did well with this recipe, I must replicate it again. Awesome write up of your macaron experience. I haven’t made them myself but they are on my (ever-growing) To Do list. Thanks for those tips and suggestions! Thank you for the lovely compliment of my writing. How very kind. Looks absolutely delicious and delightful!!!!!! Thanks it’s a challenge and a joy.